Poke cards are an engaging and fun activity to use with students of any age! My students repeatedly ask for poke cards whenever given a choice! 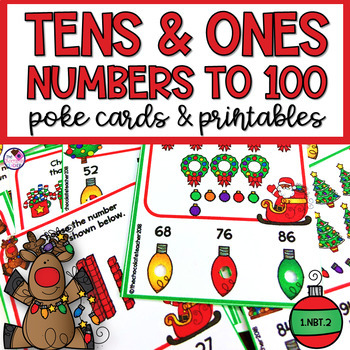 This poke card set is Christmas themed and practices tens and ones to 100. It is geared towards first grade, but could be used with high kindergarteners or as review with second graders. Students will practice counting tens and ones as objects, ten frames, and base ten blocks. I have often seen my students grasp tens and ones with base ten blocks, but not see it with objects or ten frames. I wanted to give them plenty of practice with this. Be sure to download the preview for a good look at what’s included in this unit! Thanks so much for taking the time to visit this product! Click HERE to be notified when new products are released. New products are discounted for 50% off during the first 48 hours! I really appreciate your feedback! 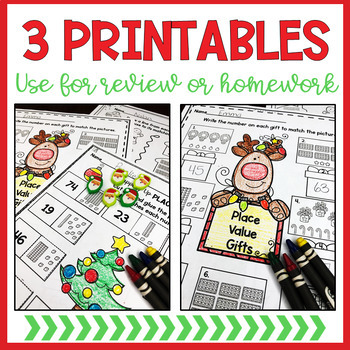 Did you know you can earn FREE credits when you leave feedback at TpT? You earn 1 credit for every dollar spent. Every 20 credits count as one dollar to be used on any product on TpT! Wow! You can’t beat FREE money!